In March, I headed to Venice for my birthday weekend. 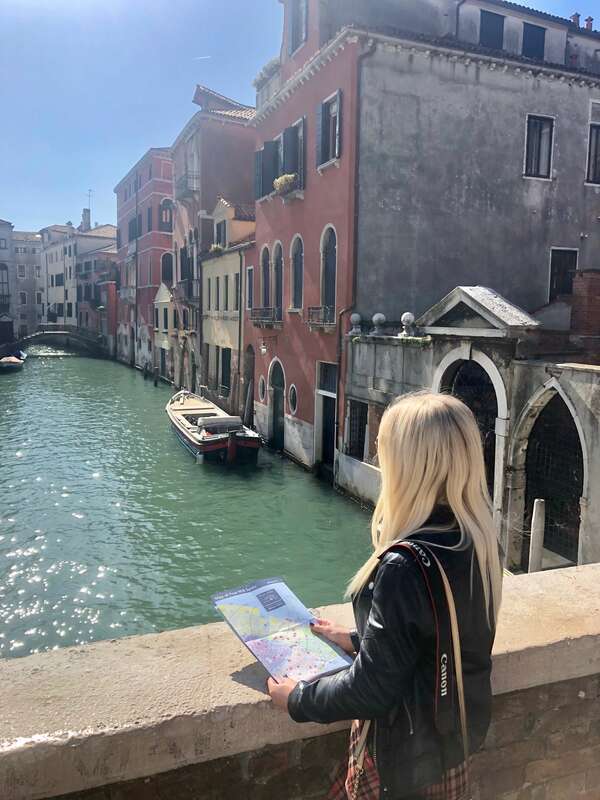 Now, Venice has been on my list for the longest time so I couldn’t wait to explore this unique city. 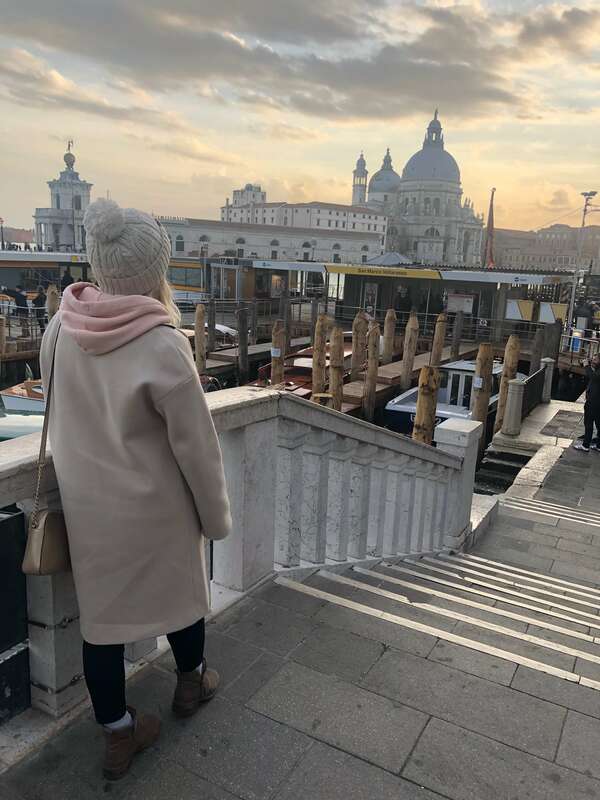 We booked our flights to Venice super-early, almost a year before we were planning to travel which meant that we got a great deal so I would definitely recommend doing this, if you can pin down dates so far in advance. Venice’s Marco Polo airport is on a different island to the main centre and so from here, you need to get a water bus to your destination. If you’re staying near St Mark’s Square, like we did, take the blue route to San Marco. The water bus does take quite a long time (over an hour and a half), so if you’ve not got much time in the city, or you’re feeling flush, book a private speedboat transfer instead. We stayed at Hotel Violino D’Oro. I booked this through Booking.com and just did a search for somewhere with good location reviews. And they weren’t lying! The hotel was literally round the corner from both St Mark’s Square and the water bus stop, making it perfect for exploring Venice. It was also really reasonably priced, comfortable and clean. It was decorated in the traditional Italian style and had breakfast views over a canal. And speaking of breakfast, it was incredible! There was plenty of choice including cold meats and cheeses, bacon and eggs, cakes and pastries, and there was prosecco too which never goes amiss. We were also left a bottle of prosecco in our room on arrival too. 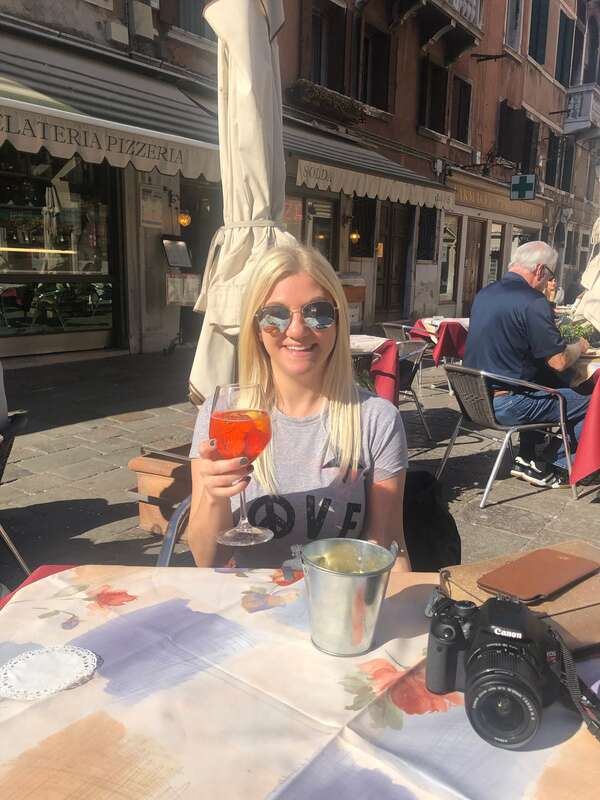 We didn’t actually do that much while we were in Venice – we did a lot of wandering around and stopping for a spritz every couple of hours. Venice is so beautiful that you can spend a long time just looking at the buildings and wandering over the bridges – there are over 400 of them in the city. Venice is a UNESCO protected city which means that nothing new can be built and nothing can be knocked down which means that all the buildings are old and interesting to look at. 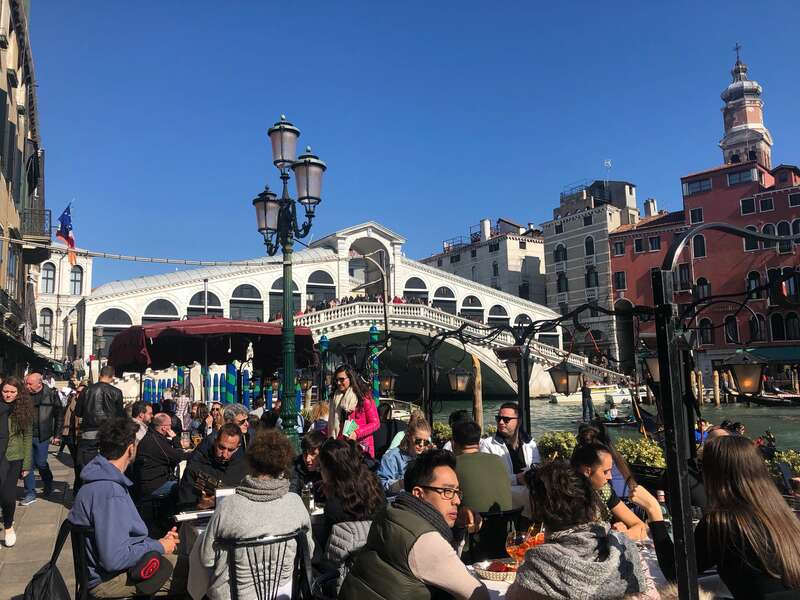 There’s the famous bridges as well to spot – you can’t miss the Rialto Bridge as it’s always super busy and the Bridge of Sighs is a great site. It’s also a great place to watch the sunset, if you get a clear day. We sat outside a bar on the bank of a canal with a few drinks while we watched the sun go down one evening. On our first morning in Venice we did a free walking tour with Venice Free Walking Tour. I think exploring on foot is a great way to see any city, and this one took us to places that aren’t necessarily on the usual tourist trail, like the city’s hospital and Marco Polo’s house, which we probably wouldn’t have seen otherwise. These free walking tours always ask for a tip at the end and it’s up to you how much you pay, depending on how good you think the tour was, but we really enjoyed this one. St Mark’s Square is probably the most famous landmark in Venice and it’s a lovely place to sit and have a drink, although the prices do reflect this. Some of the bars have classical music playing outside at night time, and it’s a really lovely place to just wander through. St Mark’s Basilica is free to enter and inside it has an ornate gold decorated ceiling which is just breath-taking. There’s also a balcony which you can access at the top of the building where you can look down into the square below and over on to the canal. There is also the Doge’s Palace in the square which you can go into, but the queue was a bit too long when we were there. 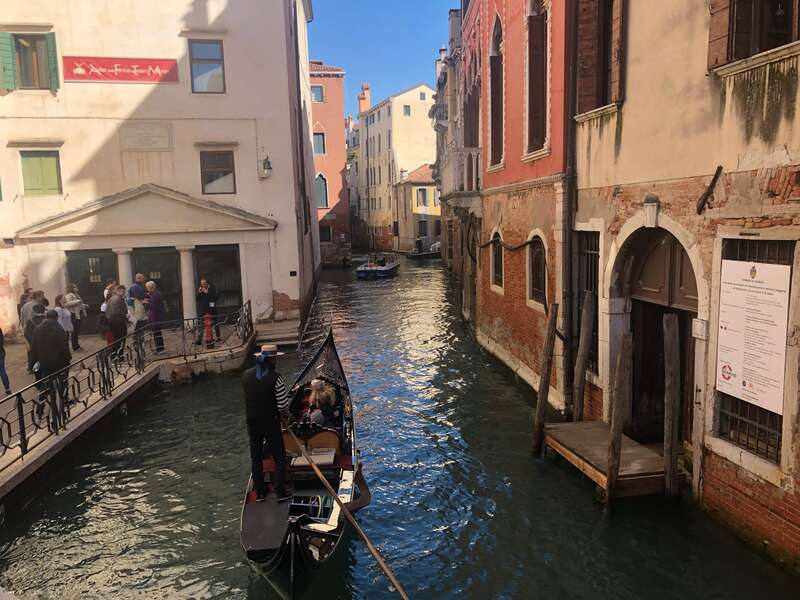 If you are visiting Venice on a budget then you should probably avoid doing a gondola ride as these are really expensive. We got the most expensive option (it was my birthday after all!) which was €120 and took us on the Grand Canal but in my opinion it was totally worth seeing the city by canal, following in the footsteps of lots of Venetians. It was one of the most romantic things I’ve ever done and our gondolier sang to us and pointed out landmarks as we went along. 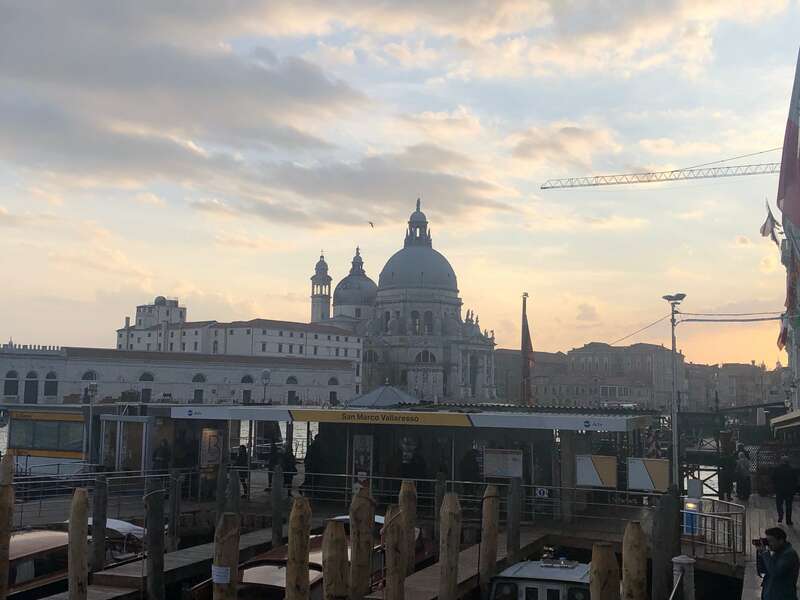 There are so many restaurants in Venice that it’s really hard to pick where you eat but I don’t think you can really go wrong, the food here is amazing and a lot better than Rome, where we were quite disappointed. We were recommended this by a couple of different people as the best place to get pizza in Venice and they were totally right. These delicious pizzas came with thick lumps of mozzarella and paper thin bases as well as fresh tomato sauce and toppings. It was super busy as well, which is always a good sign. We actually visited here after a Google search for the best risotto in Venice. Seafood risotto is one of the specialities of Venice and I was desperate to try an authentic one. Unfortunately when we got here, risotto wasn’t even on the menu(! ), so instead we opted for a couple of pasta dishes and a bottle of prosecco. The food was delicious, however, the portions were really small and we could have done with ordering a starter as well. There are plenty of places to grab a pizza slice as a snack while you’re wandering and no one does pizza like the Italians! Slices are usually available for around €2 and are absolutely delicious. Don’t forget to grab yourself some gelato while you’re wandering around too. There’s definitely a drinking culture in Venice – well, you don’t need to drive anywhere – which suited us just fine. Aperol spritz is one of the most popular drinks as well as prosecco of course and ask for ombre wine at bars to get a cheap house wine. Avoid the main stretches to get cheaper drinks but we actually didn’t find the prices too bad. We paid about €5 on average for a drink, which is the same or less than most UK cities. We had an absolutely amazing time in Venice, in fact I think it’s one of the best cities I’ve ever visited and I can’t wait to go back to explore some more. I think that three days is enough for the central parts of Venice but there are also the islands of Burano and Murano which I’d love to see next time.